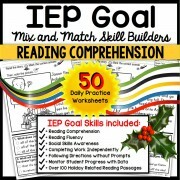 A special education and autism resource for FILL-IN-THE-BLANK sentences to enhance reading comprehension and writing skills! 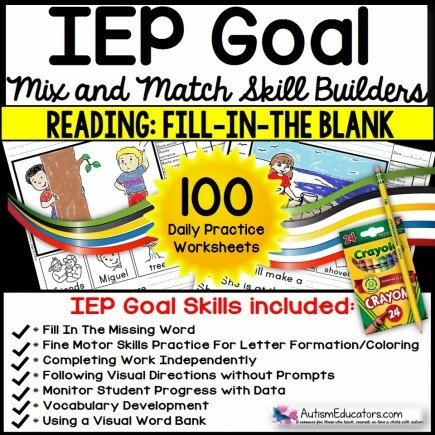 Your students will begin to work independently by increasing vocabulary, practicing pre-taught reading strategies (refer to picture or prior knowledge), fine motor skills (writing on given line and coloring picture) all while you record valuable data on each worksheet! 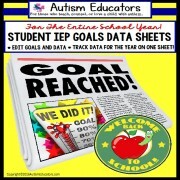 • Monitor student progress with data recorded on each worksheet! 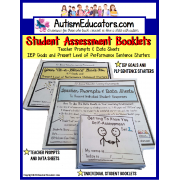 • You can place in a binder! A cover and spine label are included! 1. Given a picture and four fill-in-the-blank sentences with the LAST WORD OMITTED, along with a visual word bank containing four picture/word choices, STUDENT will read the sentence in order to COPY the correct response with 80% accuracy, in 4 out of 5 opportunities, by MONTH, YEAR. 2. Given a picture and four fill-in-the-blank sentences with the LAST WORD OMITTED, along with a visual word bank containing four picture/word choices, STUDENT will read the sentence in order to WRITE the correct response with 80% accuracy, in 4 out of 5 opportunities, by MONTH, YEAR. 3. 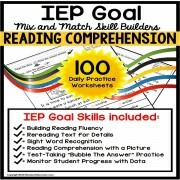 Given a picture and four fill-in-the-blank sentences with the LAST WORD OMITTED, along with a visual word bank containing four picture/word choices, STUDENT will LISTEN TO EACH SENTENCE READ ALOUD BY AN ADULT, in order to COPY the correct response with 80% accuracy, in 4 out of 5 opportunities, by MONTH, YEAR. 4. Given a picture and four fill-in-the-blank sentences with the LAST WORD OMITTED, along with a visual word bank containing four picture/word choices, STUDENT will COPY the correct responses by REMAINING WITHIN THE GIVEN BOUNDARIES (dashed line), with 80% accuracy, in 4 out of 5 opportunities, by MONTH, YEAR. 5. 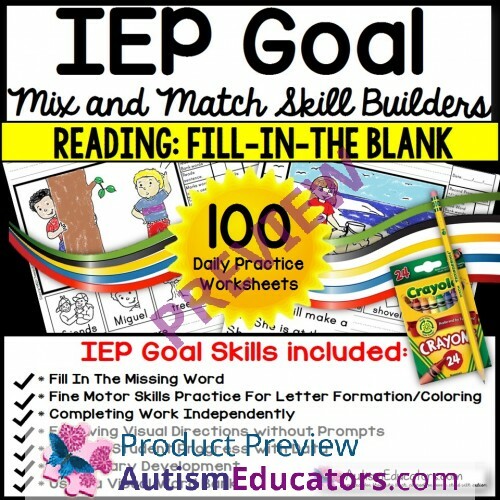 Given a picture and four fill-in-the-blank sentences with the LAST WORD OMITTED, along with a visual word bank containing four picture/word choices, STUDENT will COPY the correct responses WITH CORRECT LETTER FORMATION/UPPER AND LOWERCASE, with 80% accuracy, in 4 out of 5 opportunities, by MONTH, YEAR. 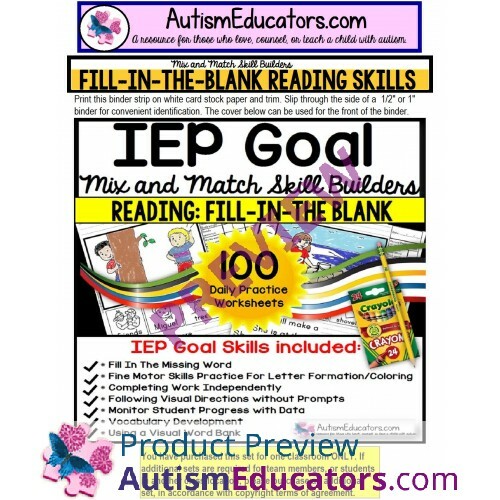 © Copyright 2017 Autism Educators, Inc. (AutismEducators.com). All rights reserved by author. This product is to be used by the original purchaser only. Copying for more than one teacher or classroom, or for an entire department, school, or school system is prohibited. 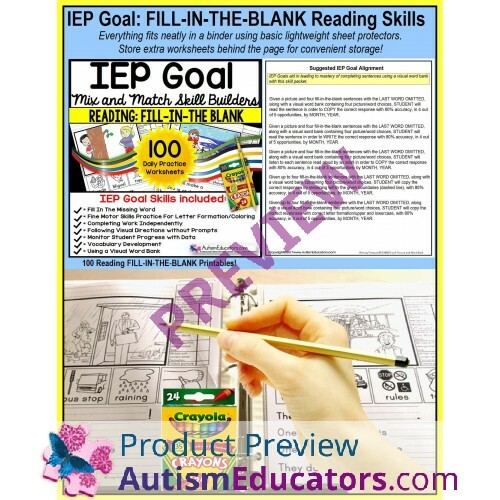 This product may not be distributed or displayed digitally for public view, uploaded to school or district websites, distributed via email, or submitted to file sharing sites such as Amazon Inspire. Failure to comply is a copyright infringement and a violation of the Digital Millennium Copyright Act (DMCA). Intended for single classroom and personal use only. Given a picture and four fill-in-the-blank sentences with the LAST WORD OMITTED, along with a visual word bank containing four picture/word choices, STUDENT will read the sentence in order to COPY the correct response with 80% accuracy, in 4 out of 5 opportunities, by MONTH, YEAR. Given a picture and four fill-in-the-blank sentences with the LAST WORD OMITTED, along with a visual word bank containing four picture/word choices, STUDENT will read the sentence in order to WRITE the correct response with 80% accuracy, in 4 out of 5 opportunities, by MONTH, YEAR. Given a picture and four fill-in-the-blank sentences with the LAST WORD OMITTED, along with a visual word bank containing four picture/word choices, STUDENT will LISTEN TO EACH SENTENCE READ ALOUD BY AN ADULT, in order to COPY the correct response with 80% accuracy, in 4 out of 5 opportunities, by MONTH, YEAR. Given a picture and four fill-in-the-blank sentences with the LAST WORD OMITTED, along with a visual word bank containing four picture/word choices, STUDENT will COPY the correct responses by REMAINING WITHIN THE GIVEN BOUNDARIES (dashed line), with 80% accuracy, in 4 out of 5 opportunities, by MONTH, YEAR. 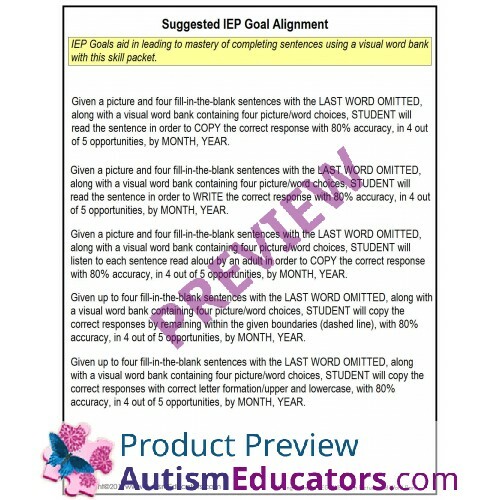 Given a picture and four fill-in-the-blank sentences with the LAST WORD OMITTED, along with a visual word bank containing four picture/word choices, STUDENT will COPY the correct responses WITH CORRECT LETTER FORMATION/UPPER AND LOWERCASE, with 80% accuracy, in 4 out of 5 opportunities, by MONTH, YEAR.